Future space missions require technologies not yet in use for the design of scientific facilities that will be larger or longer lived than anything yet flown. Spacelab and Shuttle missions add to the tools and experience that space designers may use with confidence. Thus far, several orbital tests of new technology have been performed. These technologies may shape the future of science in space. Ambitious projects that are too large to be launched as a unit by the Space Shuttle, like the 20-meter (66-foot) wide Large Deployable Reflector for infrared astronomy, will be assembled by astronauts. Understanding of the time and effort for that and similar projects will come from experiments such as the Experimental Assembly of Structures in EVA and the Assembly Concept for Construction of Erectable Space Structure (EASE/ ACCESS, 61-B). Two astronauts repeatedly assembled and disassembled two simple structures, a tetrahedron and a triangular column, to measure how quickly they would become proficient or fatigued. By all measures, the work was performed efficiently, despite the unusual size of the structures and the repetitive nature of the tasks. The weightless behavior of many mechanisms is not well understood. The Solar Array Flight Experiment (OAST-1) tested a full-scale model, 3.9 meters (12.7 feet) wide and 31.5 meters (103.3 feet) long, of a candidate design for a lightweight solar array and a new measurement technique for monitoring the characteristics of the device in space. While the wing itself proved to be very stiff, many of its motions while extended and during retraction were unexpected. It also showed a surprising tendency to bow at night into the shape of an airfoil. This information is valuable input to the engineering and design process for observatory-class spacecraft that depend upon solar arrays for power. The orbital refueling experiment on the 41-G mission demonstrated the ability to refuel satellites in space when their self-contained thruster systems have depleted fuel reserves. Refueling equipment was connected to a simulated satellite hookup, and hydrazine, a very toxic and corrosive fluid, was transferred between the two tanks. This demonstration is a precursor to actual Shuttle refueling missions for satellites. Even mundane objects such as pump bearings must be reconsidered in space. All our knowledge of bearings comes from experience on Earth where gravity pulls the lubricant to the bottom of the bearing case, forming a liquid-gas film that supports the shaft. Transparent plastic models of three types of bearings were photographed in the bearing lubrication experiment on Spacelab 1 to examine how this phenomenon changes in microgravity. The thermal canister experiment ( OSS-1) demonstrated heat pipes that control temperature by boiling and condensing ammonia within a closed circuit. These worked better in space than in ground tests, and a similar device was approved for use on the electronics module of the Astro astronomy payload. 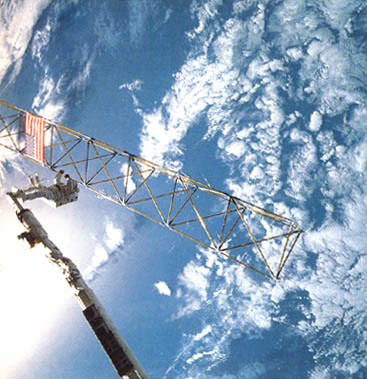 The Superfluid Helium Experiment (Spacelab 2) was significant for fluid physics (understanding the properties of this peculiar substance) and also for technology (evaluating its behavior in microgravity and demonstrating a cooling system and containment vessel). The coldest liquid known, superfluid helium is a promising cryogen for detectors that must be maintained at extremely low temperatures for best performance; effective new cryogenic systems are required for more than one space telescope now under consideration. This experiment examined temperature variations and slosh patterns in the container for information relevant to the design of superfluid helium dewars and also evaluated the temperature control system. Early results indicate that superfluid helium can be managed efficiently in space with the porous plug cryostat; data from this investigation will influence not only the science of fluid physics but also the design of new instruments for research m space. All spacecraft alter the space environment by their presence. Gases and particles escape from the spacecraft material, and various kinds of exhaust and waste are released by the vehicle's power and propulsion systems. These contaminants may compromise data collection and instrument performance. To understand the Space Shuttle's effects, an Induced Environment Contamination Monitor (IECM) was flown on three of the early orbital flight tests and on Spacelab 1; smaller contamination experiments have been carried out by instruments on these and other missions. 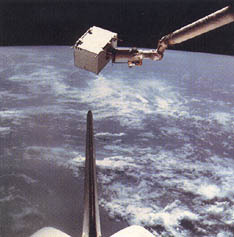 The Shuttle orbiter's impact on the environment was found to be within expectations or controllable, for example, by installing a new payload bay liner to eliminate a dust problem. Two phenomena were discovered (without the IECM) that are common to all spacecraft and weaken markedly with greater altitude. One is Shuttle glow, a dim, diffuse glow that is strongest in the visible red and near infrared parts of the spectrum. This was detected during low-light photography of a plasma physics experiment on STS-3 and raised concern that it might interfere with scientific observations. It was also studied by the Infrared Telescope on Spacelab 2, which viewed the region near the Plasma Diagnostics Package while it was being exposed to oncoming plasma around the Shuttle. Its cause is still being investigated, but Atmospheric Explorer data indicate that the glow is not unique to the Shuttle. Astronauts built the EASE and ACCESS structures in the Shuttle payload bay in experiments to determine how efficiently humans can do orbital construction. The other discovery is that atomic oxygen ,freed when sunlight splits oxygen molecules, recombines with some spacecraft coatings. This was first noticed on television camera coverings after STS -3. A similar effect had been seen on Skylab's sunshade after half a year of exposure, but since no samples were returned for analysis, the cause was only hypothesized. The research agenda for the near future includes ,further tests of cryogenic systems and assembly of large structures, elements that are crucial to the Space Station and large orbital observatories. Although the goal of technology experiments in space is to resolve engineering issues, their potential scientific benefit cannot be ignored. Improved understanding of the behavior of materials or the performance of new technology in microgravity may be applied to the design of advanced scientific instruments. Technological breakthroughs usually lead to scientific progress as well. The Induced Environment Contamination Monitor characterized the Shuttle environment during spaceflight; resultant data may affect experiment designs. 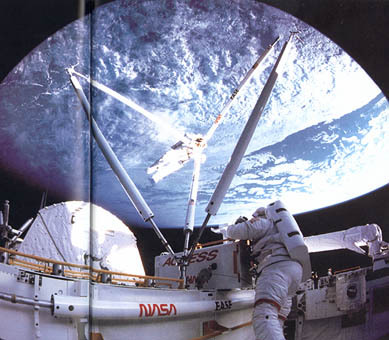 A 31.5 meter (103.3-foot) long solar array was deployed from the Shuttle to study the motions of large structures in space. Similar arrays will be used on the Space Station and large observatory spacecraft.